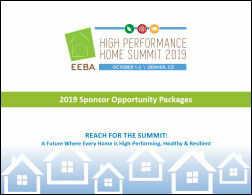 Join us for the EEBA High Performance Home Summit - the premier event showcasing the very best in high performance residential home building. Get your products and technologies in front of the only community specifically designed to help high performance builders thrive. You'll get one-on-one time with hundreds of engaged decision makers! EEBA attendees are a collection of the most forward-thinking building science professionals that want the latest and best products, and time for conversations with leading suppliers in the industry who can help them build better homes. They are the leaders and they are looking forward to talking to you. We believe the most successful way to advance the residential marketplace for high performance housing is to arm builders with the knowledge to use building science principles as a foundation of their work, and to choose the right technologies and materials for their climate and construction type. The basis of our education has always been a collaborative relationship with manufacturers – using our manufacturer Partners and Sponsors to help us get our primary message out: Choose the right products designed for optimal performance in the setting intended – then install them correctly. In addition to the latest content on healthy homes, resiliency, and how to succeed in the high-performance home building business, there will be a Manufacturers' Showcase, along with opportunities for private group meetings between builders and manufacturers to address key issues and discover the latest products and technologies available.